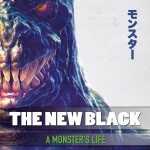 Share the post "Album review: THE NEW BLACK – A Monster’s Life"
“A Monster’s Life” is German band’s The New Black fourth release and follows on from the impressive “III : Cut Loose” from 2013. This time around, rather than self-producing again, they have enlisted famed Volbeat producer Jacob Hansen to handle the sound and an excellent job he has made. Founded in Würzburg the band have maintained a constant line up from the start, namely Fludid on vocals, Christof Leim and Fabian Schwarz on guitars together with the rhythm section of Günt Auschrat on bass and Chris Weiss on drums. A Monster’s Life is short and sweet – only 10 tracks and all clocking in under 4 minutes…but as they say it is quality and not quantity that counts…and quality is something that this has in mounds. This entry was posted in ALBUM REVIEWS, ALBUM REVIEWS (Mobile), All Posts and tagged A Monster’s Life, AFM, album, alternative rock, Chris Weiss, Christof Leim, Fabian Schwarz, Fludid, Günt Auschrat, melodic metal, review, The New Black. Bookmark the permalink.